I was debating on just which Japanese drama to pick up for the summer (yes, I am well aware that I have an incomplete drama from last summer…or was it the summer before – I’ve always said I’m horribly inconsistent, so gomen ne) and this drama just really stood out to me, well this and Rich Man, Poor Woman, but for whatever reason, I felt that this was the right drama to go with in spite of my deep love for Oguri Shun. I’ve liked most of his work to date and I’m highly enjoying his latest drama after one episode. I actually picked Iki mo Dekinai Natsu (aka Breathless Summer) for it’s unique plot that left me asking many questions and leaving me wondering if such a situation can happen in the US or not. For those wondering, the basis of the drama is an innocent and optimistic 19-year-old girl (Takei Emi) who finds out that she is not listed on her family register which means that she is not legally a resident in her country of birth, which means she cannot get a full-time job, get health insurance, rent an apartment, get married, or be treated at a hospital. Of course, amidst this family drama is a bittersweet love story with a man (Eguchi Yosuke) old enough to be her father who is a former reporter now working nights at the register office in penance for a past accident. *I’m sorry as I still remember Takei Emi as Nao from Asuko March, I’m having trouble keeping her name straight. So if you see Nao anywhere, it’s probably referring to Rei and not her younger sister Mao. We open with Tanizaki Rei talking about how most people take their lives and all the good things in it for granted. From happiness, to jobs, etc. She asks people to be aware of these things as there are people much less fortunate who struggle to be able to obtain such happiness, but do not have the ability. I think you take it for granted. That thing that you take for granted…there are some people who can’t even have that. For those people, the life you take for granted looks like an extremely happy one. The existence you have in this world in which you were born into they feel just that alone would open up vast possibilities for their futures, so it makes them more greedy. They want to do more and more. If you didn’t have the feeling that you are alive now, then it can’t be said that you are alive. That happiness, no matter how much you may take it for granted…Please be aware of it, and forever please look to the future and walk towards it. It’s heavy, but it is very relevant to this story and mirrors Rei’s transformation into a girl who was happy with her life to a girl whose life was completely devastated and turned upside down by one important fact. Tanizaki Rei is a 19-year-old who works part-time (how it can be considered part time when she works from early in the morning to late at night most days of the week is beyond me) in a patisserie called Charlotte. She is very interested in becoming a pastry chef and is always the first one there cleaning, prepping, and practicing. That day she learns that after working in the store for 4 years (she started while she was attending high school), she has the opportunity to become a full-time employee. This shocks her and was totally unexpected. Just earlier she was talking to two other employees that going to Paris to study abroad (which you can only do if you’re full-time) is just a dream she can never obtain. However, now that she can become full-time, her dream is closer to becoming a reality. Immediately after work is done, Rei heads off to her register office to get the proof of citizenship (in this case an ID) so that her promotion can be processed. There she meets the cold and unfriendly Kiyama Ryuichiro. Why he’s working in as a public servant when he doesn’t seem to be too friendly or personable is a mystery (for now at least). Rei hands him her forms and he asks for proof of identity. While I understand, I do find it amusing that in order to get proof of your identity, you need proof of your identity. Isn’t that a conundrum? What would work the best is a health insurance card. Rei doesn’t have one on her and she begs Kiyama to bend the rules in order to help get the application processed quickly so that she can get all the paperwork processed to become a full-time employee. Kiyama actually does something that shocks his coworkers. He accepts the application without the proof (Rei promises to come back the next night with the proof after work and she even tried to bribe him with her apple pie she had baked that day). My favorite part about this scene was 1) how she tried to bribe him with pie and 2) how she kept trying to use her library and video rental cards as proof of ID. Once home, Rei searches all over for her health insurance card while her little sister Mao happily eats the pie that Rei intentionally made a mistake on so she could bring it home. Mao points out where the important documents are kept and Rei is surprised to find health cards for her sister and mother, but not for herself. At that moment their grandmother arrives and seems much more interested in Mao than her eldest granddaughter. Why is that? Meanwhile, Mrs. Tanizaki works the night shift at the hospital where she is a nurse, so Rei can’t ask her where her health insurance card is. Also, the grandmother seems worried when Rei brings up the register’s office. Rei gets up early to leave for work and sees her mother’s light on. She sees a book for beginner’s French on the table and smiles. She then goes in to ask her mother about the insurance card, but her mother is asleep. Rei covers her up and leaves. We then see Mrs. Tanizaki’s eyes open. She was only pretending! She also seems to have a very worried look on her face. At work, Rei is pressured about getting her identity card. Rei says the paperwork had been handed in and that she will go to the register’s office to hopefully pick it up. Her boss urges her to get things done quickly. Meanwhile, she will push through Rei’s promotion without the documents. She then tries Rei’s apple pie and gives it the okay to go out in the shop to sell. This makes Rei extremely happy. Kiyama hands over Rei’s application to his superior who asks for the proof of ID. Kiyama states that the girl will bring it later that night. Kiyama is then scolded for his cold and impolite attitude and he is told to smile more often. As Kiyama turns to go, he learns from his superior that Rei is not listed in the ward’s registry as living with her mother and sister. Did something happen and a slip-up occur? They check the original records and three people were registered at the Tanizaki house. Mr. and Mrs. Tanizaki and their youngest daughter. Mr. Tanizaki was taken off the registry not too long after, so why isn’t Rei’s name in it? Kiyama’s superior says it might be that Rei is not the Tanizaki’s daughter and is not even aware of it. That night Rei comes in as another young man (Nakamura Aoi) comes in wondering if you can sign up for welfare without having a resident card. I only mention him as I know he’s going to be an important character later (even though I don’t know his name now) and he seems really interested in Rei. I have no idea why, but while she was talking to Kiyama about her residency card, he was all ears. Rei hands over some letter and asks if that can be used as proof. Kiyama says that it can and Rei is relieved. So, where is her ID? Kiyama doesn’t answer and just asks her to confirm her address and her mother’s name. Rei does so and learns they can’t issue her the ID since she isn’t registered in that household. Rei rattles off all of her schools and wonders if her mother and sister can get ID cards. Kiyama says they can and Rei wonders why it’s just her. Rei then asks Kiyama to check in to see if it might be a mistake of the ward office. Kiyama promises to look into it and Rei goes off promising to come again. Seeking answers, the worried Rei goes to visit her mother in the hospital where she works. Rei tells her about the troubles with getting the ID and then asks if she is really Mrs. Tanizaki’s daughter. Mrs. Tanizaki hesitates a bit and then hurriedly says that of course Rei is her daughter. Rei is relieved to hear this and thanks her mother for giving her the French book. At home, Mao finds it weird that her elders sister can’t get a resident ID, but she and their mother can. Mao also thinks its some sort of mistake made by the ward office. The two girls then plan a surprise party for Mrs. Tanizaki’s birthday which is the next day. Meanwhile, the young man from earlier looks up Rei’s workplace. Why is he so interested, why? We don’t find out in this episode. We also don’t learn his name in this episode, so he’s just that young man. Rei searches through things and is more relieved when she finds a photo of herself as a baby with her mother. Kiyama is going home and walks by Charlotte where he sees Rei working hard. He continues on to his house. He is living with a woman and her son and you can tell that the woman is really not happy to have him under her roof. Her son, on the other hand, loves having Kiyama there. In fact, he invites Kiyama out on his fieldtrip, but Kiyama can’t go because of his hours at work. Man it looks like he just gets a tiny bowl of cereal for breakfast. That’s not very nice, especially as it looks like she made a nice breakfast for herself and Naoto. Anywho, he promises Naoto that he will take him to the park to play on his next day off. Meanwhile, Nao works on baking her customary apple pie and decorating it for her mother’s birthday. We then cut to a scene in the country where Kaname Jun is is looking for the president of a business there, Shosuku Natsume. We don’t know why, but he appears to know some things about him (like how his wife had just died a few months ago, etc.). He then learns from a worker that Shosuku is in Tokyo visiting his relatives. And that’s all we see of Kaname Jun in this episode. I’m pretty sure his character will have some type of significance, but I am not sure what just yet. Meanwhile, Shusuku goes to Charlotte and is waited on by Rei. He seems to really have an affinity for the girl. Is she the family he’s visiting? And just who is he to her as Rei doesn’t seem to know him at all? He buys two slices of Rei’s apple pie, making the girl very happy. Kiyama is heading to work when he runs into a man who calls him sempai. It turns out the other man is a reporter doing stakeouts and the such. It looks like he’s on probation and working his way back to the news desk. The younger man then asks if Kiyama won’t be coming back as he seems to think it’s a shame that Kiyama is no longer a journalist. He tells Kiyama that the scheme he uncovered and the subsequent accident wasn’t his fault. We then get a mini-flashback to the woman from earlier yelling at him to get out (probably at her husband’s funeral). I wonder what the whole story is with that? Kiyama then investigates Rei’s case with his boss. It seems that Mrs. Tanizaki was married and divorced and Rei was born only a few months after Mrs. Tanizaki’s 2nd marriage. That means that Rei is most likely a 300 days victim. What does that mean? If a woman is divorced and has a child within 300 days of that divorce, then the child is legally her ex-husband’s and thus should be registered on his family register. There are parents who choose not to register so that their children are not registered under the wrong father. His boss then tells him to approach the matter delicately. Rei returns home with her pie and Mao has the place all decorated. Their grandmother is even there to take part. Rei then heads out to the ward office just before they call asking for her. This really perks the grandmother’s interest and she is sure to let her daughter know when she gets home. It looks like grandma is not happy to have the family register division of the ward calling. Just what is going on? Why does the grandmother seem so mean and why does Mrs. Tanizaki seem so worried? At the ward office, Rei received the big blow that she is not included on her family registry. Kiyama is left to explain the situation. Poor Kiyama. He tries to tell Rei to go back and talk to her mother and then come with her mother to the ward office. Rei doesn’t wish to. She may be considered a minor still (she wouldn’t be in the US. Your technically a legal adult at 18), but this is her life and her work. Kiyama tries to explain why she needs to talk to her mother and take work off to come down to the ward office, but Rei has had enough. She is confused and angry and takes this all out on Kiyama. Doesn’t he know how much she needs that resident ID? She needs it for her job, to be able to study in Paris, etc. Kiyama then snaps back that since Rei is unregistered she technically does NOT exist. This means that she can’t get full-time work. she can’t get married, her children will never be on her family register, she can’t get a passport, etc. You can see how horrified his coworkers are. So much for handling that with tact, but at the same time, Rei was being unreasonable and just wasn’t grasping the situation. She needed the slightly harsh wakeup call. Rei stays out all night and Kiyama runs into on his way home. He gives back the picture Rei showed him earlier of her and her mother, proving that she was her mother’s daughter. He wanted to give it back as he knew it was precious. He then tells her as she walks away that there is a way for her to create a family register. It will be hard, but it can be done and things will be better after that. Rei goes back home and does research into the matter of not being in the family register and seeing other people’s posts on the matter and knowing that she can create one, Rei goes in to confront her mother. Mrs. Tanizaki insists that Rei is her and her 2nd husband’s daughter (although she really hesitates on that last part). Mrs. Tanizaki explains the 300 days law, but Rei isn’t having any of it. How could her mother do this to her? Didn’t Mrs. Tanizaki realize that things will be a lot harder for Rei if she isn’t officially registered? Rei then begs her mother to go down to the ward office the next day and get things started to fix this big mistake, but it looks like Mrs. Tanizaki doesn’t wish to do so. Why? Why would she let her daughter suffer and not help her out? Is there some big secret Mrs. Tanizaki is hiding (besides this obviously big secret that was hidden for 19 years?). The distraught Rei runs out crying as Mao comes out to see what the commotion is. Kiyama heads home and catches Naota and his mom just before they leave. The little boy asks Kiyama if he can’t come along, but Kyama replies again that he can’t because of work. He again promises to take Naota to a park next time he’s free. The mother and son leave and Kiyama notices Naoto’s hat lying forgotten on the floor. He picks it up and heads out after the little boy. Meanwhile Rei goes to Charlotte where she has a meltdown and throws the pans to the floor. Her one coworker comes in and wonders what’s wrong, but Nao says nothing and runs out. Once outside, she falls to the ground. Nakamura (since I don’t know his name in the show, I’ll just use his real last name) goes by and says that her arm is bleeding pretty badly and she should go to the hospital. Rei recalls Kiyama’s words. No. With no health card she can’t go to the hospital for treatment. She continues walking and starts to realize how everything was a lie. Everything that was hers is gone. No, not gone. It had never existed. She then passes out in the middle of a street. People call an ambulance against her wishes and Kiyama sees her lying on the ground and that’s where we end this episode. But this is a really good start. We have some great acting here. 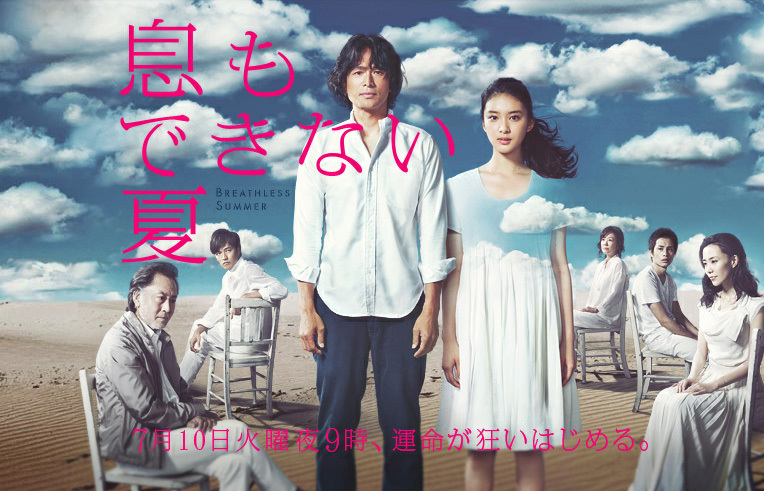 Takei Emi seems to improve with each role and I have liked Eguchi since seeing him in Lunch Queen. He was never a big man, but he’s slimmed down quite a bit since then. This show really makes you think how such things can happen. In the US, I do know that if you’re married or recently divorced some doctors what to put the husband/ex-husband’s name on the birth certificate whether they are the father or not. But we don’t have this family registry thing. You have a birth certificate that has at least your mother’s name. It’s not necessary to have your father’s. And nowadays, the hospitals immediately send in the paperwork to get newborns into the system with their social security cards. So its really hard to imagine something like this happening. But different countries, different customs, different laws. It’s really amazing. I watched the last 10 minutes of ep1 but then decided this isn’t the drama for me. Thanks for recapping though! I was intrigued by this drama and wanted to watch it. While I wasn’t 100% happy with it, I decided that the plot and societal and familial issues it dealt with was reason enough to watch and recap 😛 It was either this or Rich Man, Poor Woman and this one won out in the end. I am liking Oguri Shun’s role and the lead actress is doing a good job. As much as I like Inoue Mao in Tokkan, it’s not a drama that I think can be recapped very well. Oh, and the promo poster is great! I love the concept! Yeah, the poster is pretty snazzy. Since you watched the last 10 minutes, then you didn’t get to see the opening clip which is really where you can see where the poster concept comes from. It’s pretty spiffy. I watched its 1st episode but i also then decided that this isn’t the Jap drama for me. I can take on Rich Man, Poor Woman if you’d like. I was thinking about doing both dramas, but just wasn’t sure if I would have the time commitment as summer is the season for gardening and once July and August hit, I spend a lot of nights picking veggies and helping to clean and can. I know Iki mo Dekinai Natsu won’t be to everyone’s taste as it is a very heavy drama and not everyone’s cup of tea, but I am liking it, even though it is very frustrating and we are only 2 episodes in. I shall try to get episodes 1 & 2 of Rich Man, Poor Woman up this weekend. Thanks for the recap. I thought Kiyama was married (seeing Naota and his mom). How can they live under the same roof? I reckon the Shosuku Natsume is Rei’s paternal grandfather. The two young men are a mystery to me. Initially, it does look like Kiyama was married, but he isn’t. He’s living with the Takaokas I believe to make up for inadvertently leading Naoto’s father to commit suicide. You are right about who Natsume is & even tho we do learn a bit about Kusano (Nakamura Aoi), he is still a mystery to me. Wow, I love this drama. it’s a refreshing change from all the more rom/com drama that the japanese tend to have with idols. I enjoy this type of drama where love is second to the plot. It is ver subtle and handles all the angst in this drama amazingly. it’s not perfect but it touches on reality. I know, I do, too. It’s a welcome change from rom/coms. And there are those complaining about the lack of romance, but I agree that it’s nice for it to be on the back burner, although it looks like its coming to the forefront in the next few episodes. The actors are doing an exceptional job and while the plot does have a few issues, it’s still amazingly good.